After last chance meeting by Ha'am Itanu's rabbis, Ben-Ari says unity to be sealed by evening - unless additional demands leveled. 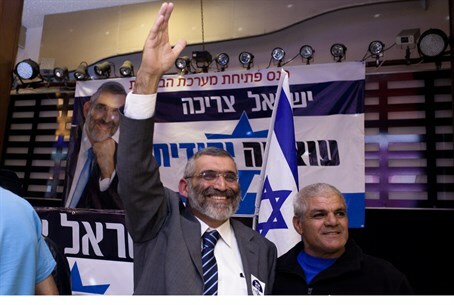 A last gasp meeting between Yachad - Ha'am Itanu's rabbinical counsel apparently bore fruit, as Eli Yishai's party and Dr. Michael Ben-Ari's Otzma Yehudit party reportedly are to sign on an agreement by 6 p.m. on Wednesday - or else decide to run separately once and for all. Ben-Ari wrote on Facebook "with G-d's help the contacts are advancing towards signing (a technical bloc unity deal) with Eli Yishai. We made large concessions to very harsh demands. Nothing is sealed yet." "If by 6 this evening the agreement isn't signed, it's because of additional demands," he warned, adding that if that were the case, "we will be forced to submit an independent list" ahead of the Thursday deadline for submission. Hinting at the demands made by Yishai's party, Ben-Ari included in his post a report on Ha'am Itanu's odd request that nationalist activist Baruch Marzel from Hevron be in the fourth spot of the shared list, instead of Ben-Ari who would be in the sixth spot. A recent poll showed that if the parties ran together they would easily pass the threshold with seven seats, meaning even if the offer to have Marzel in at four was agreed to as Otzma Yehudit sources say has already been done, Ben-Ari would likely get in as well. The development comes after Rabbi Meir Mazuz, Yishai's rabbinical counsel, met with Rabbi Tzvi Tau, the rabbi of MK Yoni Chetboun who joined Yishai, at Rabbi Tau's home in Jerusalem on Wednesday morning to discuss saving the talks, after the night before they were reportedly collapsed by last minute demands from Yishai's party. Two central demands were apparently made, the first being that Otzma Yehudit agree to sit in a coalition led by Binyamin Netanyahu "at any cost," so as to secure funding for Rabbi Tau's Yeshivat Har Hamor and other institutions. Ben-Ari has made clear that he would not joint any coalition unless firm ideological red lines were set, and furthermore the technical bloc paradigm by which they would run jointly allows them to separate after elections and each keep their seats, meaning the condition would not be needed for Yishai to join a coalition. The second condition was that Otzma Yehudit promise publicly to the media that they would never ascend to the Temple Mount - the holiest site in Judaism. Otzma Yehudit had previously called for Jewish prayer rights on the Mount to be a central platform plank, and consulted with Rabbi Dov Lior, chief rabbi of Hevron - Kiryat Arba, who ruled they must not agree to the demand. It is of note that Rabbi Mazuz has himself ruled in support of visiting the Temple Mount, leading to conjecture that Rabbi Tau was behind the demand; the two rabbis likely discussed this point and given Ben-Ari's message apparently some understanding was reached.